Alabama unveiled on Thursday the first of several portions of a massive $140 million beachside enhancement project at Gulf State Park. The $7 million Interpretive Center and East Pedestrian Bridge, described as a “gateway” entrance into the sprawling 6,150-acre park, was officially opened during a ribbon cutting ceremony. It’s the first part of a roll out of features at Gulf State Park that will be highlighted with the Nov. 1 opening of a conference center and 350-room Hilton Hotel. “The interpretive center will help explain what makes the State Park so great,” said Chris Blankenship, commissioner of the Alabama Department of Conservation and Natural Resources. The Interpretive Center will feature interactive exhibits aimed at educating visitors about the park’s environmental attractions. The exhibits will be installed next month, Blankenship said. 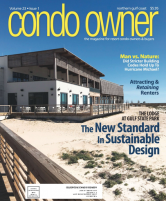 The center also includes a multi-use room, a covered porch with interactive exhibits, an elevated plaza, public restrooms, bike parking, a sand-play area, amphitheater seating and benches overlooking the Gulf. Connected to it is a pedestrian bridge above East Beach Boulevard that allows visitors a safe access to the park’s trail system. “The Interpretive Center is the launch point for the 28 miles of trails inside the park,” Ivey said. Bill Bennett, regional director and general manager with Atlanta-based Valor Hospitality – the company contracted to operate the new additions – said the Interpretive Center is a sustainable addition that will generate “105 percent” of power and water needed to operate it. The goal, Bennett said, is for the building to be certified as “Living Building,” considered the most rigorous environmental certification in the world. Lee Sentell, the director of Alabama’s Tourism Department, described the Interpretive Center and East Pedestrian Bridge opening as a “great tease” ahead of the conference center and hotel’s opening in November. 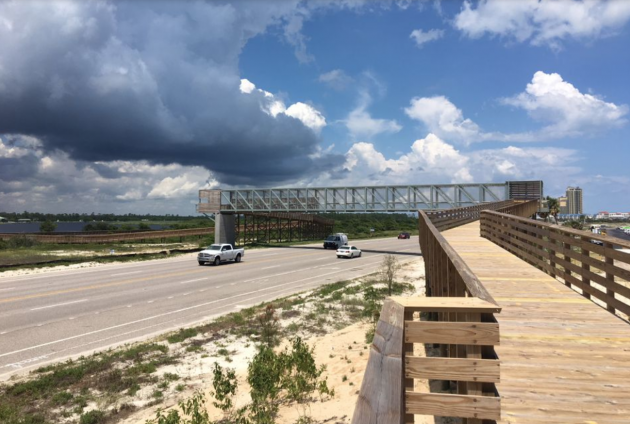 Construction is ongoing to that facility, located just west of the Interpretive Center and East Pedestrian Bridge between Gulf Shores and Orange Beach. It was a tease that was in financial and legal entanglements not long ago. A federal lawsuit in 2014 challenged the process by which the project was approved during former Alabama Gov. Robert Bentley’s administration. A group called The Gulf Restoration Network had long argued that the hotel and conference center represented a misuse of BP oil spill money that was supposed to restore natural resources. The state, in October 2017, agreed to spend $65.1 million over a 15-year period starting next year to maintain and operate the public amenities at Gulf State Park as part of a settlement that was reached in that lawsuit. The agreement also stipulated that the state will maintain and manage a host of non-conference center elements of the project for 20 years, and will not charge fees for the public’s use. Among those features is a research and education facility that will open next year. Trails, beach access, pedestrian pathways and the Interpretive Center will also be accessible to the public without fees. But past legal issues were not part of the discussion on Thursday. Instead, state officials eyed the new development as an attraction that will add to what has been record-breaking tourism since the 2010 Deepwater Horizon disaster and oil spill that ravaged Alabama’s coastal beaches. On Tuesday, Ivey and other state officials unveiled the state’s annual tourism statistics, which showed Alabama luring $14.3 billion in tourism-related expenditures last year. Sixty-eight percent of that money came from five counties: Baldwin, Mobile, Jefferson, Madison and Montgomery. The state saw a 3.3 percent spike in visitors during 2017, from 25.8 million in 2016 to 26.6 million last year.